Seated around the special table in the Michaelangelo dining room, our Chef's Table dinner started in earnest. 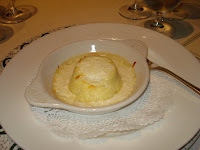 We were served a tasty goat cheese souffle (?) that wasn't listed on our menu. On our bread plates were two varieties of fresh breads--one dark, one white. I sampled the dark one and it was moist and tasted a little sweet, maybe even nutty. I resisted finishing the whole piece and filling up before the main courses arrived. Chef Pollara bragged a bit about the lobster risotto we were about to receive. Coming from Italy, he claimed it as a specialty. His claim was rightly made. It was wonderful. The dish could have been a meal in itself. 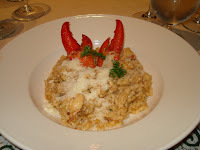 It was a risotto that had just the right consistency and chunks of lobster as well as two claws to tantalize the taste buds. A small scoop of raspberry lemon sorbet was next. It's called "palate cleansing." Palates cleansed, we were ready to receive our main dish. 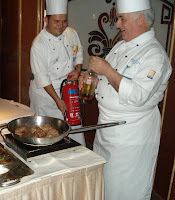 With flouri sh, Chef Pollara appeared again with an assistant (and a fire extinguisher for laughs). 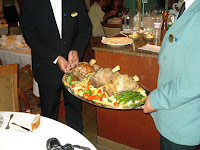 Two waiters carried in a tray with three huge veal shanks on it. 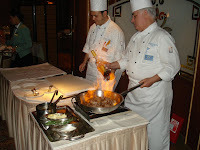 After the picture taking, the tray was set on the table where the chef was preparing veal tenderloin as well--flambe. When all the final touches were made to the veal and the veggies, our plates were set before us and we gave a unified groan. There was enough food on each plate to feed three people. I've never seen so much meat on a plate before. 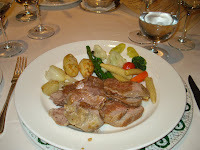 And the best/worst part was that it was absolutely delightful--tender, tasty, moist, melt-in-the-mouth veal. I never wanted a doggie-bag so badly in my life. And I don't have a dog! The meal continued as we guiltily left behind what we could not eat and exchanged it for a serving of baked Camembert and pieces of walnut bread followed by little confections and cookies all leading up to the grand finale. Chef Pollara introduced the head pastry/confection chef whose name I'm afraid I did not catch. As he was introduced, we were presented with amazing creations for dessert. On a molded sugar base tinted blue was a bit of pastry with a scoop of creamy confection from which extended two antenna-looking pieces of hardened sugar with a sugary spring holding them together. If I heard right, he said it took several hours to put it all together. Along the way, Commodore Romano stopped by briefly to say hello. We must have met a good deal of the ship's officers by the end of the evening. 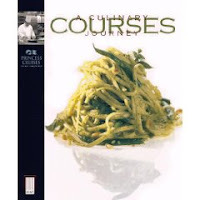 With our elaborate desserts before us, we were also presented a copy of Courses, A Culinary Journey, signed by Chef Pollara. The ladies all received a red rose as well and the ship's photographer stopped by to take pictures of each couple as well as the group. 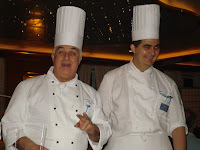 Each photo p osed with Chef Pollara and Maitre d' Ciorfito. The pictures were delivered moments later to our table. Lest I forget, all of the dinner was accompanied by wine pairings--white, red, a sweet dessert wine, and lemoncello (or soft drinks if you preferred). And ended with coffee. The whole evening lasted from 7 until 10:30 p.m. at which time we helped each other out of our chairs and vowed we would not need to eat again for at least three days. Except for the obscene amount of food served to us, the dinner was wonderful. Smaller portions would have been nice since there were so many courses. But I have absolutely no complaints about the taste of the food. 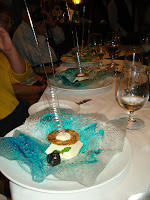 Each dish was amazing and the attention given us made us truly feel VIP. Ooh, Karen, I'm a foodie, too! Would've loved every minute of it! Thanks for sharing with such rich, juicy writing! Thanks for stopping by Patti! I love good food--just not so much at one time. How did you reserve the chef's table? We will be on the Crown in June! We dialed the reservations number on board ship as soon as we boarded. Cruise lines often give you the opportunity to book ahead for specialty restaurants and the spa but sometimes that doesn't work out or the response will be that they are full when they really aren't. Check your cruise info when you receive it or go online for information to book ahead.